Automate patient privacy monitoring with Artificial Intelligence. 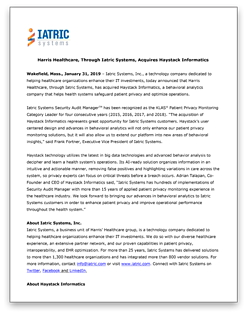 Using AI and behavioral analytics, Haystack™ analyzes every access to PHI, removes false positives, and presents your staff with only truly suspicious activity. Let Haystack help your privacy experts find anomalous behavior quickly and easily, before a breach occurs. Request a demonstration today. *Selected Commentary Collected about Security Audit Manager by KLAS from January 2017 through January 2018 respectively @KLAS Enterprises, LLC. All rights reserved. KLASResearch.com KLAS does not provide quote name or company attribution. Article: Can you meet stricter privacy rules with limited resources?